When the Ottoman Empire met its demise in the early twentieth century, the new Republic of Turkey closed down the Sufi orders, rationalizing that they were antimodern. Yet the nascent nation, faced with defining its cultural heritage, soon began to promote the legacies of three Sufi saints: Mevlana Celaleddin Rumi, Hacı Bektaş Veli, and Yunus Emre. Their Turkish ethnicity, along with universalist themes found in their poetry and legends—of love, peace, fellowship, and tolerance—became the focus of their commemoration. With this reinterpretation of their characters—part of a broader secularist project—these saints came to be considered the great Turkish humanists. Their veneration came to play an important role in the nationalist formulation of Turkish culture, but the universalism of their humanism has exposed fissures in society over the place of religion in the nation. 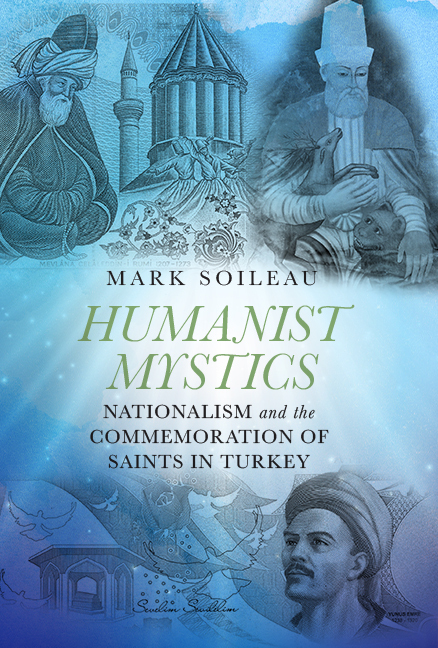 Humanist Mystics is the first book to examine Islam and secularism within Turkish nationalist ideology through the lens of commemorated saints. Soileau surveys Anatolian and Turkish religious and political history as the context for his closer attention to the lives and influence of these three Sufi saints. By comparing premodern hagiographic and scholarly representations with twentieth-century monographs, literary works, artistic media, and commemorative ceremonies, he shows how the saints have been transformed into humanist mystics and how this change has led to debates about their character and relevance. Mark Soileau received his Ph.D. in religious studies from the University of California, Santa Barbara. He is currently associate professor of anthropology at Hacettepe University in Ankara, Turkey.